Everyday meal planning …… EEEhhhhhh!! Do you find meal planning difficult and look for cooking tips on how to make food taste better and add new dishes to your meals? I find meal planning to be a tedious thankless task. Not only do you have to plan and think about what you will be cooking today, tomorrow or the day after but also need to shop accordingly. And to avoid stressful cooking, the majority of us fall back to cooking dishes we are most comfortable with, like pasta, rice, soups and curries. Of course, there is nothing wrong with this. Our lives are too busy to cook fancy dishes every day, but monotonous cooking and same tastes do have a tendency to make mealtimes predictably less interesting! On my quest to learn how to make tasty food at home and add flavour to meals without much effort I discovered that adding spices was a simple cooking technique to instantly enhance flavour of the food and also add variety to your home-cooked meals. List 12 easy to find spices to make tasty food at home in just a few pinches. Explain the flavour profile of the spices used. Tips and ideas on how to use the spices in dishes and cook different meals. Recommended spice combination what works with other ingredients. A list of easy 30 minutes recipes for you to try at home. There is no dearth of recipes to find these days with the internet swamped by food blogs and websites (including mine), cooking shows, magazines even newspaper publishing recipes. You think of an ingredient, google it for recipes and voila …. there will be pages and pages for you to look at. But sometimes it’s not just about following a recipe as you may not have all the listed ingredient to make a dish which can be rather frustrating. Cooking or making a dish taste better is in a way the intuitive way of cooking. That is you have a rough idea about what ingredients go with others and combine them together to make something delicious without the pressure of relying on recipes and ingredients every time. 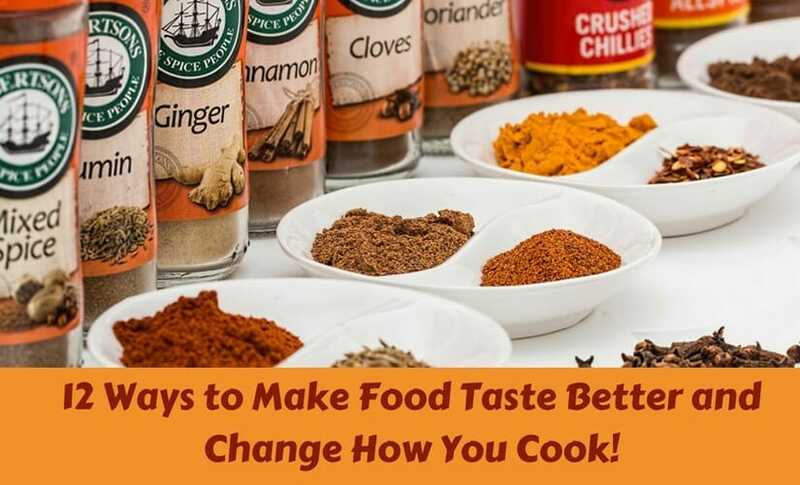 The focus of this post today is to encourage intuitive cooking and change the way you cook, simply by adding new flavours in the form of spices and herbs and make every food taste better in a dash!! This list of 12 flavour packed spices and herbs will surely add a ‘zing’ to your cooking and make food taste better and a ‘ting’ of taste to those eating! There is no magic or a set rule for good cooking. This is because each of us has our own way of cooking and methods we use. But there sure are tricks to make bland food taste better. However, one universal element of cooking is TASTE! Seasoning is what makes food taste good. We normally use salt and pepper to pep up our dishes. Imagine if we broaden our scope of seasoning and bring in more exciting flavours ……. again in a dash !!??? As you already use the basic two seasoning, aka salt and pepper, or perhaps few others, let’s elevate our taste buds to a notch up at a time with these simple yet powerful flavour enhancing spices and herbs. Start by adding just one spice each month of the year and work with different suitable combinations before you introduce another one! Slowly but Surely these little culinary experimentations will change how you perceive spices and the way you cook with them. Nutmeg is a seed kernel used to flavour sweet and savoury dishes, popularly used in Middle Eastern, Indian and European cuisines. It is a delicate spice with strong flavour. Nutmegs are sweet-scented and pungent. The popular form of nutmeg is whole seed. You can freshly grate nutmeg with the help of a grater into the dish. It can also be used to delicately enhance the flavour of meat dishes and sweet or root vegetables such as potatoes, carrots, turnip etc. Nutmegs go well with dairy products such as cheese sauce and is added to many desserts such as apple, rhubarb or pumpkin pie, custard, rice pudding etc. An Italian herb mix is a mix of dried Oregano, Basil, Marjoram, Rosemary and Thyme. Just a sprinkle of a teaspoon or two of this mixed herb adds a rounded flavour to any pasta,fish and chicken dish. Mixed Italian Herb is very easy to use. You simply need to add a few teaspoons directly to the dishes such as tomato-based sauce, cheese-based sauce. You can also use it to make dressings, salads, stews, marinades and rubs. Pasta, fish, and white meat. Also combines well with dairy and tangy based sauces such as tomato sauce, lemon garlic sauce etc. Bring in an oriental twist to your meals by adding a bit a Chinese 5 spices to your meats and veges. This spice mix falls between sweet and pungent. Use the spice blend directly into the dish you wish to cook. It makes a very aromatic rub and marinade for meats such as pork, duck and beef. You can also use it as a seasoning for making fried rice, noodles, stir-fries and also broth of soup. Since it already has different blended spices, its best to combine the spice with sauces such as tomato sauce, soya sauce, and other oriental sauces. It enhances the flavour of meats, vegetables, noodles and rice. Cloves are the aromatic dried flower buds from the clove tree. Popularly used whole, ground cloves powder can also be used. It has a very strong sweet and pungent taste. Cloves can be used to make both sweet and savoury dishes. Whole cloves are commonly used to flavour oil, sauces or to add flavour to broths and curries. You can also use it for making barbeque sauces, soups and pickles. Use cloves for pies, dairy-based desserts and also drinks. Cloves go well with almost any type of ingredient and other spices. Few of the best combinations are red meats, nuts, sweet vegetables such as pumpkin, carrots, sweet potato, peas. The best spice combination is cinnamon, cardamom and bay leaves. Also called ‘pimenton’ its an aromatic Spanish red paprika powder that adds a subtle smoky flavour to dishes it is used in. It can range from mild to hot depending on the kind of heat you choose. Add directly to the dish you, however like most spices do take care not to add too much to the dish as a small spoonful render strong smoky flavour to the dish. It can be added to roast vegetables, all kinds of meat especially sausages and also eggs. Add a pinch to dressings or sauces. Use in marinades, dips or soups. Red meat and vegetables such as potatoes, zucchini, aubergine. It combines well with spices such as cloves, cinnamon and cumin powder. Known as the queen of spices due to its high price and aromatic properties. Its a flower bud and is popularly used in many cuisines. You can either use the pods whole, crushed or in powder form. Green cardamon pods are used for curry, rice or even to flavour coffee in Arabic style. It can be used to make both sweet and savoury dishes. Simply add it to the dish to enhance flavour and aroma. Green cardamoms go well with almost any vegetable or meat. This aromatic spice is great for flavouring dairy based desserts. Taco or fajita seasoning is a popular mexican inspired spice blend easily available in any super market. You do not have to stick to making fajitas or tacos with this seasoning but use it to make different kinds of dishes. Its a mix of garlic powder, chilli powder, red pepper flakes, cornstarch , oregano, cumin powder and salt. This versatile spice mix can be used to make curries such as chili beef, roast vegetables, pasta sauce, marinade, dips and even soup. It goes very well with tomato sauce, yogurt, lemon, mince meat,couscous, legumes and many vegetables. You do not need to add any extra spice if you are using a taco seasoning. A zesty aromatic leaf of kafir lime trees, the leaves are used in South Asian cuisine. It has a very strong aroma and used whole to add a deep fresh flavour mainly to curries and broth. You can either choose to cut the leaves or use whole in the dish and simmer for the leave to infuse their aroma. Use it for making curries and flavoured broths for noodle soup. Chillies, ginger, shallots, fish and chicken. Similar to a taco seasoning but uses additional spices such as cayenne pepper, garlic powder, sweet paprika, dried oregano, dried thyme, ground black pepper, onion powder. Perhaps the most popular Indian spice mix used to make a basic curry. There is no set recipe for a curry powder mix but primarily has turmeric powder, cumin powder, coriander powder, ginger powder, curry leaves powder and chilli powder. Curry powder is added directly to the dish and is best when sauteed with other ingredients in oil to remove the strong raw smell of spices. It can be used to make curries, marinades or stir-fries. Goes with any kind of meat, vegetable, legumes, rice and rice noodles. Za’atar is a traditional Middle Eastern seasoning that typically includes a blend of dried thyme, oregano, sumac, toasted sesame seeds and salt. Zaatar is used as seasoning just like salt and pepper; that is, it is added to a finished dish such as salads, steaks, breads . You can also use it for making dips and rice-based dishes. When in doubt with lifting flavours instantaneously, add a dash of any flavoured salt to your dish. There are many different kinds of flavoured salts available in the market these days such as garlic and herb salt, chilli salt, curry flavoured salt, Chinese salt etc. Since it is a seasoning its best to add a dash of salt to the finished dish or while sauteeing and even directly in any broth or liquid used to boil to retain maximum flavour. Add flavoured salt to salads, marinades for grilling or steaming, stir-fries and chips. A flavoured salt goes well with any vegetable, meat, chicken, fish or legumes, eggs. Share your favourite spice or trick you use to lift flavours of your meals. It’s always fun to learn from others. I’ll have to bookmark this and come back to it. I don’t do a ton of cooking so sadly I haven’t tried about half of these spices… But, I can’t wait to now. I’ll let you know how it goes! Thanks Alphonso so stop by and comment. Do keep me updated on your foodie ventures! This is great! I’m currently in a phase where I’m testing out some spices and I’m not really sure yet what spice I should use for a specific recipe. Thanks for sharing! I hope you find the information useful! Do try them, it surely changed the way I cooked with spices and become more adventurous when it came to eating! I’m definitely going to be using some of these ideas! Great Read! I can’t even tell you how much I enjoyed your tips! I’m always looking for new ways to change things up in the kitchen, especially because I eat a lot of vegetables and it’s easy to grow tired of the flavours! I am so glad you enjoyed reading it. Hope the tips come handy! Hi Kara! That’s the reason I included in my spice must have list! Great roundup of spices! I love adding different spices to change up a dish. I have yet to try Za’atar, but it’s on my list. I love that you included nutmeg. I’ve only used it in baking and need to branch out and add it to a savory dish. Thank you so much for sharing this. This post is now going to be added to my favourites! I do use herbs and spices in my cooking but always use the same ones! I am now feeling very inspired and looking forward to trying out your tips. Thanks Lucy for your kind comments. Enjoy spicing Upp your dishes! Wow! So many new things I want to try! I’d better get a pen and paper! Tomorrow is grocery day! I love using spices in my cooking and mixing them together. They can make or break a dish. Cajun seasoning is my favorite. So true. Spices add a depth of flavour to a dish. All you need to know is using it correctly. I’m so glad I read this post! I try so hard to make new dishes but never know what spice goes with or does what in a dish. Unfortunately, my dishes though I think they are different, end up tasting about the same half the time. I look forward to using this in my cooking as I further my blog. only 1 suggestion pics of each would be helpful, I’m a visual person and like to see what things look like to associate better. Thanks so much Carrie. Glad you enjoyed reading the post.I will review this and add few pictures for sure.